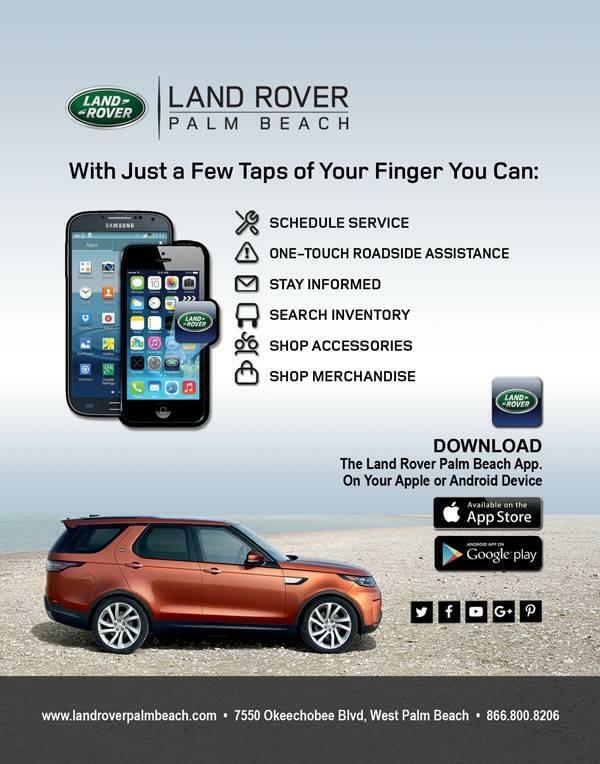 Introducing the newly redesigned Land Rover Palm Beach mobile app. SCHEDULE SERVICE – Call us or schedule your appointment directly through the app. ONE-TOUCH ROADSIDE ASSISTANCE – Access 24-7 Land Rover Assistance, local gas pricing, parking assistant with GPS Locator, flashlight and more. STAY INFORMED – Access Land Rover tutorial videos, news, and notifications on exclusive dealer offers, events & announcements. SEARCH VEHICLE INVENTORY – Access quick & intuitive inventory listings within the app . Scroll through photos, view Carfax reports, get a quote or schedule a test drive. SHOP ACCESSORIES & MERCHANDISE– Browse Land Rover parts and merchandise, from wheel caps to ball caps. Available for download on your Apple & Android devices.